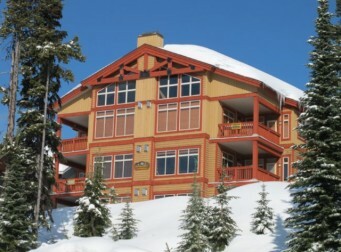 This beautiful unit has a spacious living room with a spectacular unobstructed view of the Monashee Mountains, a 50 Flat Screen TV with DVD and entertainment system and a rock faced gas fireplace. The deck with hot tub is accessed from both the living room and the Master Bedroom. An ensuite bath with glass shower is attached to the Master Bedroom with Queen Size bed and a second bath with tub and shower are located off the central hall. The second bedroom features a queen bed also. A double sofabed is located in the den with double doors along with a 27 TV, DVD PLayer and Playstation. There is a separate laundry room with full size washer and dryer and ski storage. There is a carport for one car and room for a second vehicle behind it. Words do not descride the quality of the snow, the resort, and especially Black Rock Manor #3. The Huge choice of runs, the great ski school for kids, a massive 240+ cm of snow and more fresh stuff each night... Snowshoe Sams, the Snow Ghosts, the lack of queues, the mandatory latte at Beano's each morning, and of course who could forget the hot tub!!!! These are all memories that will stay with us forever. A great apartment. We will recommend it to all! This resort is by far the best one we have been to. The snow is amazing, the people are friendly, and the food is to die for. Thank you for providing us with these awesome accommodations to stay in. We enjoyed the place & the easy ski/in ski/out access. We hope everyone has a great stay & we wish all have great snow for their stay. From the city of Kelowna (Hwy 97), turn South on Highway 33. Follow it for about 30 minutes (36 km) and watch for a blue sign that says “Big White Ski Resort” at the top of the long grade. Turn left on Big White Road and follow the road for about another 20 minutes (24km). Approximately 8 km after you pass the Gem Lake Lift at Westridge, you will come to a "Welcome to Big White Ski Resort" sign. Turn left just past this sign at the “Snow Pine Estates Development” onto Snow Pines Way. Continue on this road straight. You will pass 4 streets on your right, the last one being Snow Pine Crescent. Go past Snow Pine Crescent and Black Rock Manor #3 is the 2nd house on the right. The address is #3 - 5885 Snow Pines Way. It is a beige building with rust red wood trim. Use the Entry door on the right (The ones with the stairs) for Suite #3.